The second rut spurs another round of buck activity. Put the second rut to work for you. In my younger days, I used to feel tremendous envy while reading stories about the second rut. Growing up in Northern Wisconsin, I believed this was a magical time saved only for those in the states that fell below my own. Truth be told, I was wrong. Unlike the southernmost states, where once the first does are bred some form rutting activity can be seen for months after, breeding is much more condensed in the north. Here, the timing of spring birth demands that the vast majority of does are impregnated in a fairly tight window of time. If she is bred to early her fawns may be born during the tail end of harsh weather conditions. If born while snow still covers the ground or in single digit temps, the odds of a fawn’s survival are drastically reduced. The same is true if the fawn is born late. In that case, it doesn’t have the time to grow as much before the hormones kick in that halt growth and inspire fat production. If the snow depths are significant that winter, not only is being small a handicap for travel, it results the fawn’s inability to reach as high to eat the buds on trees. The result is an animal that must expend more energy to travel, yet isn’t able to compete as well for nutrition. Obviously, that is a bad combination when straddling the line between life and death. Now, all of this must be combined with the fact that, over the course of a year, northern deer can’t intake the same potential amount of nutrition as the deer that live in areas that don’t have long-term snow cover. For example, a fawn born even in Illinois has a fighting chance of being able to feed on greens, acorns and the waste in farm fields until some point in January. In much of the northern herd’s range, not only are there vast areas void of any farming, but the much earlier average snow fall often buries any morsel of food on ground level, leaving less nutritious woody browse as their best choice. With the healthiest fawns making up most of the second rut in the Upper Midwest and point further north, the increased nutrition that occurs as we travel to the mid regions of the US allows a higher percentage of fawns the ability to come into estrus. Of course, in the parts of the deer’s southern range where droughts and poor soil conditions hamper the available level of nutrition a reduction in the percentage of fawns that come into estrus occurs, as well. Rather amazingly, even with all the hurdles facing the northern deer, some fawns typically do come into estrus each year. Even in the UP of Michigan, where excessive snowfall and frigid temps are the norm, an average of 5% of fawns come into estrus early in their first winter. The point is that, despite my youthful belief that the second rut didn’t exist in the northern regions, it does. It’s just far less noticeable than in areas that experience milder winters. 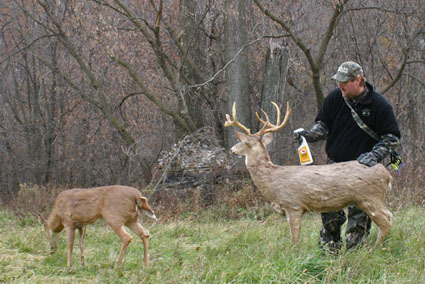 Another factor that helps mask the North’s second rut is the drastic reduction in rutting buck activity. Much like fawns that try to survive their first winter, the bucks are also handicapped. 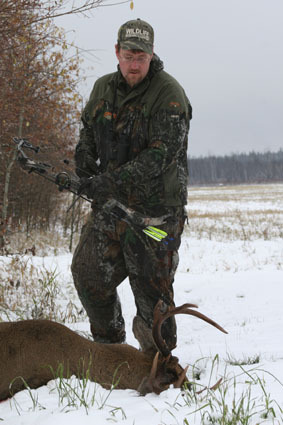 Having burnt 25-30% body weight during the rigors of the rut, mature bucks must now contend with trying to survive winter. Because their fat reserves are depleted, they simply can no longer afford to invest their energies covering miles and miles of ground each day. If they did, chances are that it would cost them their lives. Instead, they’re primarily focused on conserving energy. Commonly, this involves in setting up reduced home ranges that are hinged upon the best remaining food source. Luckily for their chances of catching second rut breeding opportunities, the family groups are now concentrated around them, as well. Because of that, they can spend most of their day resting and still check a good number of fawns at the late afternoon food source. When one of the local girls enters womanhood, you can bet that the area’s bucks will be competing to win her favors. Of course, with freezing temps and snow cover remaining for even a week being rare in the southern regions, the deer residing there don’t face the same obstacles. In the South, adult does have the luxury of being able to successfully produce fawns born very early or late. Because of that range in birth dates, along with a host of other contributing factors, does are bred for a much longer window of time, blurring the lines between a first and second rut essentially into one elongated rut.